fewer inhaled organisms are enough to cause infection. Factors important in transmission include the frequency of coughing, the adequacy of ventilation (transmission is unlikely to occur outdoors), and the degree of crowding. Immunodeficiency can result in activation of latent tuberculosis, and over 5% of AIDS patients have developed active tuberculosis. The tuberculin test, also known as the Mantoux (pronounced man-too) test, is an extremely important tool for studying the epidemiology of the disease and in detecting those who are infected with M. tuberculosis. The test is carried out by injecting into the skin a very small amount of a sterile fluid called purified protein derivative, or PPD, derived from cultures of M. tuberculosis. 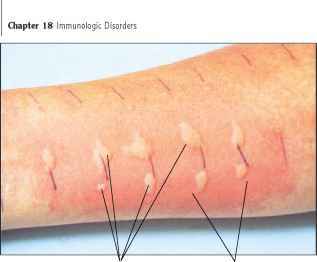 People who are infected with the bacterium develop redness and a firm swelling at the injection site, reaching a peak intensity after 48 to 72 hours (figure 23.19). This reaction is due to the congregation of macrophages and T lymphocytes at the injection site, a manifestation of delayed hyper-sensitivity to the tubercle bacillus. A strongly positive reaction to the test generally indicates that living M. tuberculosis bacilli are present somewhere in the body of the person tested. A positive tuberculin test does not necessarily mean that the person has tuberculosis; only that he or she has been infected by M. tuberculosis at some time in the past.